Renault Trucks has broadened its range of electric LCVs, introducing its all-electric Master ZE. Designed with last-mile deliveries in mind, the Master ZE is available in six versions with a choice of two heights and three lengths and can transport payloads of up to 1,370kg. Load areas are also identical to the combustion-engined versions as the battery packs are fitted within the bodywork. Powered by the same 76hp electric motor found in the Zoe passenger car, the Master ZE offers a top speed of 72mph and a claimed driving range of 75 miles. A full charge can be performed in six hours when connected to a 7.4kW charging point. Renault’s ZE Connect system allows the driver to check the vehicle range on a smartphone or computer via the Internet while the ZE Trip facility means charge points can be found via the vehicle’s navigation system. 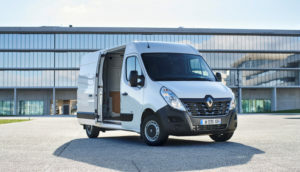 Ashwani Gupta – SVP, LCV Business Unit, Renault-Nissan, commented, “With Master Z.E., Renault Pro + is enlarging its e-LCV line-up consistent with the “Drive the Future” strategic plan, in which 100% of vans will be electrified. The current line-up, ranging from quadricycles to heavy vans, covers the main needs of business customers in terms of cargo volume and payload, enabling them to make emissions-free last-mile deliveries in city centres. In addition, a new ecosystem of connected services has been rolled out to improve fleet management and help customers to grow their businesses”.